In this series of articles celebrating the upcoming 30th Anniversary of Super Mario, various members of the Nintendo Life extended family will share their memories and thoughts on the iconic franchise. This time we have our reviewer, contributor and all-round swell guy Ron DelVillano. When discussing video games with someone new, one question will infallibly come up. It's the one question that all players dread. It's the unanswerable conundrum that keeps us up at night and is ever-present in the back of our minds for fear of answering incorrectly. I couldn't begin to count the number of times that I've been asked this, and I couldn't begin to count the number of times that I've changed my answer. But between Mike Tyson's Punch-Out!! !, Harvest Moon 64 and Altered Beast, one game always jumps to the top of the list. The one game that I can say for sure is definitely in my top five – at least during this telling – is the platforming masterpiece Super Mario World. The Super Nintendo was the first home console that I owned and, being a pack-in game, Super Mario World was my first home console game. As it was the only title that I owned for a while, I played countless hours of Super Mario World. I've beaten Bowser numerous times, I've cleared all of the castles, and I can still recall how to access most of the secret exits. To say that I'm good at Super Mario World is an understatement, but to say that my cousin Vinny is great would be a crime. We don't claim to be the best, and we're both still wowed by the more remarkable speed runs, but I don't think I would be too far off base to say that we're probably better than you and your cousin. To take a step back, this is just as much a story about my favourite Mario game as it is a story about how ridiculously compulsive my cousin and I are about playing it. Growing up, life was as exciting and vibrant as can be during one's youth, but we never passed up an opportunity to jump into some 2-player hijinks rather than engaging with the outside world. It was a simpler time when neither of us had responsibilities and new video games were only accessible when we had enough birthday money saved up, so we were forced to focus on the one title that we had. Right next to Nonna's mostaccioli and meatballs, Super Mario World became a staple in our diet. As new generations of consoles came and went, Vinny and I still found ourselves hooking up the SNES whenever we were together and seeing how many stages we could breeze through in a single sitting. As I perfected my platforming skills, Vinny excelled in locating and memorizing the locations of every secret and alternate path the game had to offer. 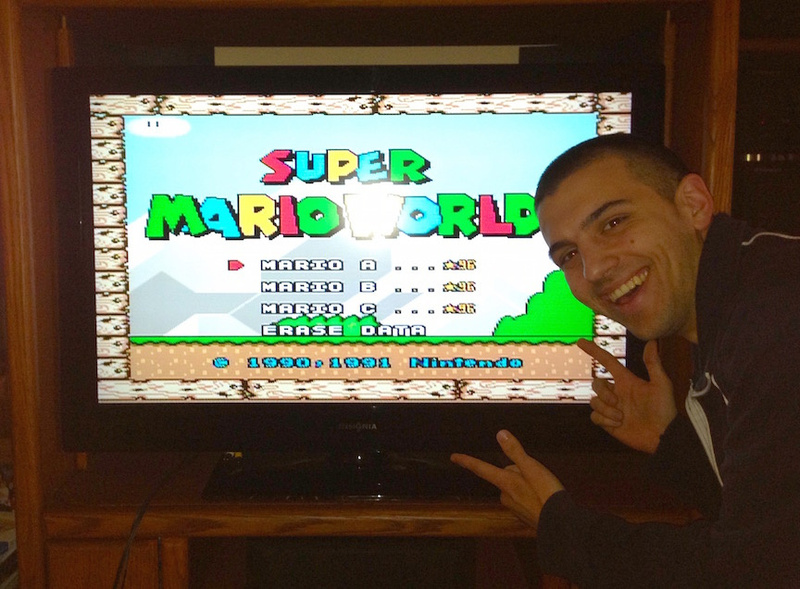 We never got tired of Super Mario World, we only got better. About two years ago, all of this playing, this training, this wasted youth, culminated into our single greatest achievement: having three completely finished save files on a single cartridge. What this really meant is that we just played through the entire game three times, but what it meant to us is that we had found a finite end. Our entire lives playing this one game had been spent working towards some sort of perfection, and we finally decided on a place to comfortably stop. Vinny called me recently to catch up. I hadn't talked to him in a while and it was nice to hear his familiar voice. I told him that I was thinking about writing an article about the time that we completed three save files on Super Mario World and we shared a laugh. He liked the idea and encouraged me to do it. After our great foray into the depths of obsession and completion, we've since moved to opposite ends of the country to pursue completely different paths in life. We both have varying degrees of responsibility now, but we still find the time to play video games when it's available. It's been a few years since Vinny and I have played Super Mario World together, but I'm pretty sure we're still better at it than you. Bwahaha! Thanks for a great laugh and read. Totally, had to save enough birthday money for a game. I actually ended up buying my own SNES years later because my older brother had already convinced my parents to get a Genesis. At least some friends had it and Super Mario World a few houses up the street. They sucked, I had to do practically everything for them in the game. Pfft, I'll take you AND your cousin Vinny on anytime, anywhere! Just kidding, I'm sure I'd get a flogging. @ikki5 lol... I agree, best buy better have my preorder ready and waiting. Remembering those secret exits is a pretty nice achievement, I don't hesitate to say secrets is my ultimate weakness in Mario games. Hold on a moment Ron, your favourite video game used to be Altered Beast?! Hmm. I should play this game again. @MJKOP Maybe you know this, but if you look at the levels on the world map, if they flash yellow they only have one exit, if they flash red that means they have two exits. That might help to narrow down which one you've missed! @BulkSlash hey, thanks for the advice. Yeah I was aware of that but I'm still not sure what I'm missing, but I will look again tomorrow... thank you! This is the one game that I loved soo much but still never finished. Until today, I don't know exactly why. @MJKOP From what I recall, the Forest of Illusion has a ghost house that has two exits. One leads to a red dot level that also has an exit that leads back to the ghost house. The paths overlap so it would be tough to know if you got 'em both by just glancing at the map. Good luck! @Dazza I could EASILY write another article about Altered Beast and why it's so important. Here's the kicker: it has nothing to do with nostalgia! @Environ hey thank you, I'll get back to it this week, I figured it was something in that Forest, I bet you're right! @Ron_DelVillano get on that article!